Home/NeoStrata/NeoStrata Bionic Face Cream 1.4 fl oz. 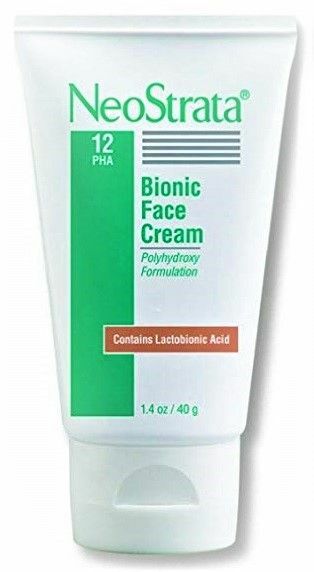 NeoStrata Bionic Face Cream: PHA 12 - This professional strength aging skin cream is formulated with 12% PHA (8% gluconolactone and 4% lactobionic acid), for age-defying benefits, antioxidant effects and moisturization of all skin types. It will leave sun-damaged skin feeling and looking smoother, healthier, younger and more radiant. Repeated use may reduce the appearance of fine lines and wrinkles and promote a more even skin tone. Ideal for post-cosmetic procedure care following microdermabrasion, non-ablative laser and glycolic acid peels. Fragrance free. Hypoallergenic. 1.75 oz. jar. Exfoliates skin to fade signs of aging. Calms irritation and hydrates skin. An essential amino acid plays as an antioxidants that helps build collagen production. It also repairs and rejuvenates skin.